I just bought plane tickets to Denver for the the middle of May for a week to do some sightseeing. I plan on heading into the mountains to find some good challenging drives as well as spectacular scenery. I want to drive through Glenwood Canyon as well as the Million Dollar Highway and CO-145. I wouldn't mind to do a couple of roads in the Salt Lake City area as well. I am wondering however, does anyone have any suggestions for what would make for a good drive? Other scenery or worthwhile attractions along the way. I tend to wing my trips, so I am very much open to suggestions for the area. Especially if you're planning to get from the Million Dollar Highway/CO 145 area to Salt Lake City via Moab, Arches National Park is a real treat, and doesn't require a lot of hiking off-road. Canyonlands NP is more of a detour off the highway, and its arches are not as spectacular as the ones in Arches NP. Last I was there, the brochure for Arches NP had helpful hints about what times of the day are best to view and photograph the various arches in the park, so you can make most efficient use of whatever time you allot to the park. 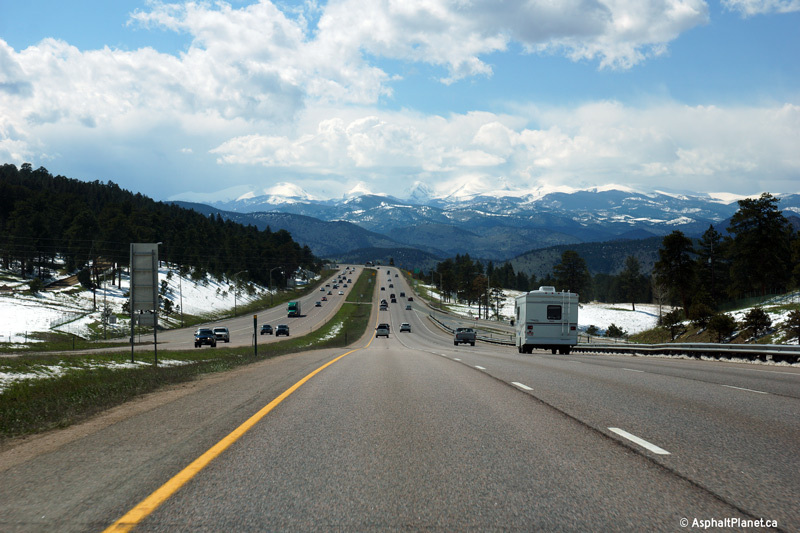 A few easy side trips from I-70 up to high passes include Loveland Pass (US 6), Fremont & Tennessee Passes (CO 91 & US 24) and Berthoud Pass (US 40). I did arches and canyonlands on a previous trip to the area a couple of years ago. I would consider doing Yellowstone this year, as its only a days drive from Denver. UT 12 is a must-drive, though it might be a little out of your way. For a great nighttime city view take I-215's eastern section in SLC. One more picture for today. Coming into Downtown Salt Lake City along US-89 at dusk. Well, tomorrow is my last full day of my vacation, so I figure I'll do a little synopsis of the trip so far. I started the trip by flying into Denver(from Detroit). I finished my midnight shift last Wednesday at 07:30 and had to book it to Detroit to catch my 12:30 flight. I got through airport security at 11:53 in the morning, only 2 minutes before my flight started boarding. I was pretty worried that I would miss my flight, I didn't leave myself a lot of time. I rented my car through Enterprise. I typically rent through Enterprise. I arranged for a standard car which is typically a Chrysler 200 or similar. I had a Chrysler 200 when I toured California last fall, and was reasonably impressed with it. This time, I scored a VW Passat, which is an awesome ride. I put my rental cars through their paces driving through the mountains, and the Passat has passed every test with flying colours. The car is powerful, and handles wonderfully. Once in Denver, I went directly west along I-70 staying in Grand Junction. There was still a lot of snow on the mountain passes, and it snowed heavily through Vale along 70. I-70 is awesome, and Glenwood Canyon is jaw-dropping. 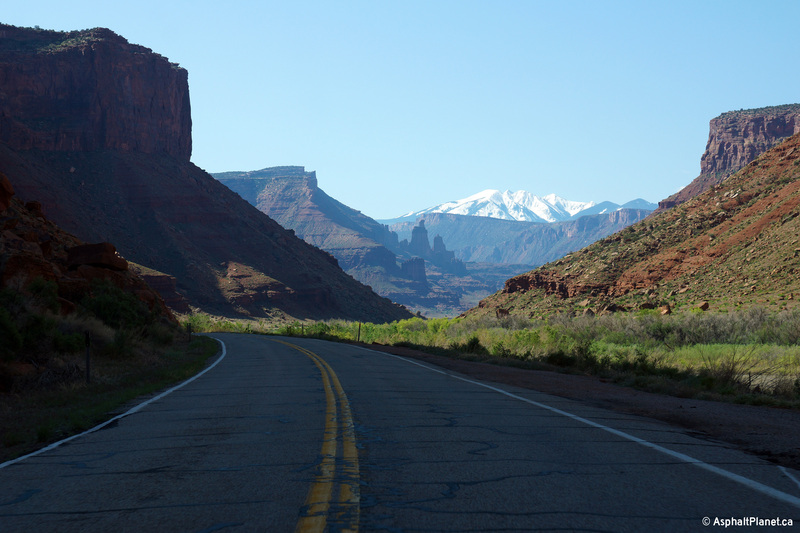 On day 2, I headed west and north from Grand Junction, stopping briefly in Moab. I then took US-191 through Price and continued through to Green River, WY. Day 2's highlights were definitely Moab as well as US-191 through Flaming George. I would have liked to have done WY-530 as well, but time didn't permit. Day 3, I continued north from Green River to Grand Teton and Yellowston NP. It was pretty overcast on this day, which kind of spoiled how beautiful the landscape is through both parks. I did see some wildlife though, which was cool. Tons of snow up this way, and again I was surprised that Yellowstone Lake was still completely frozen over. Day 4, I went north from Yellowstone following US-191 up through to I-90. I took I-90 east to Livingston and then turned around and took I-90 all the way to US-12 in western Montana. Montana is pretty beautiful, I had no expectations of what it would be like, but I was impressed. I stayed in Dillon, MT that night, at an America's Best Value Inn, that was pretty underwhelming. The clerk who checked me in was pretty creepy actually. Day 5, I went westerly through Wisdom to US-93 at Lost Trail Pass and then continued southerly through Idaho into Salt Lake City. It was pretty stormy that morning, which kind of ruined some of my pictures, but such as life. I made it as far as Ogen, UT that night, and finally got my fix of In and Out Burger. Day 6, I stayed in the SLC city area, and drove a few of the mountain passes around the city. I-80 east of SLC is amazing, as is US-189 up Provo Canyon. In the evening I went for a bit of a walking tour in Downtown SLC. It's pretty lively for a small American City, though is quiet for what one would expect in a Canadian city. One of the downtown bars even had the Canadiens Game on. Day 7, (today) I left Provo and followed I-15 south to US-50 where I cut south to I-70. I followed 70 as far east as UT-24 where I turned south in order to to UT-95 through Glen Canyon. Glen Canyon is pretty amazing. I then worked my way over to Durango, CO, where I currently type this. Tomorrow I will drive US-550 northerly along the Million Dollar Highway and then back to Denver before flying out early on Thursday morning. The Million Dollar Highway was closed due to a rockfall back in January, so they are currently fully closing the highway 6 days a week between 08:30-18:30 to secure the rocks along Red Mountain Pass. So it will be an early day for me tomorrow to get up there before they close the road in the morning. In the mid-Nineties a friend and I did a long trip to Moab, Four Corners, Vegas and back to Provo in April in two days. One of the highlights was the rest stop by US-191/I-70. I had brought along a small microwave oven to heat up our meal and we sat at a table, eating and taking in the vast dramatic view of the terrain. It was in the lower 70's and sunny, perfectly gorgeous! Provo Canyon US-189 was getting it's freeway put in while I was there. Talk about some serious terrain taming! During the summer when it is in the 90's for Provo/Orem, you go into the canyon and the temp will drop 20 degrees. Nature's air conditioning is something! Every time I drove through the canyon it made me homesick for Oregon. Wow, did they cut the highway through that towering red cliff? What an amazing scene. 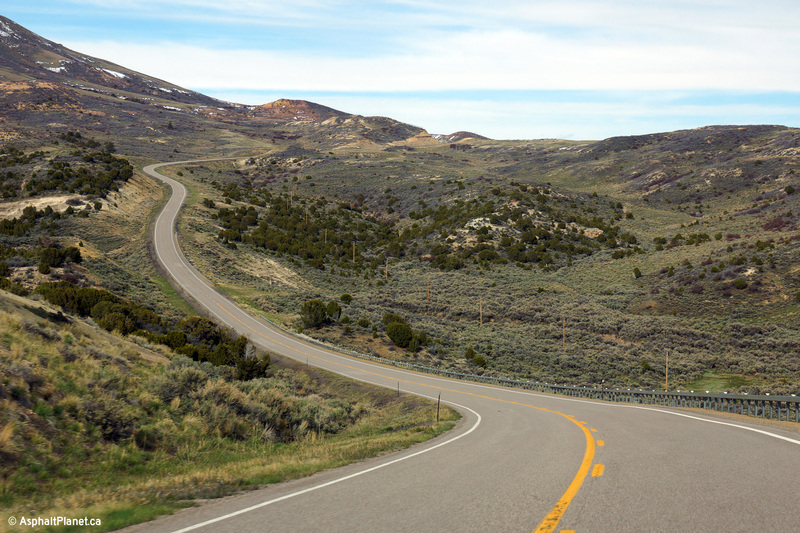 I've not yet driven Utah 95, but it is on my to-do list! Not only did they cut the highway through the cliff, but they (whether intentionally or not) built the Colorado River arch bridge exactly in the right location for it to be the focal point of the vista through the towering red cliff. UT-95 is awesome. I had visited Utah to see relatives before. Payson is an idyllic community 15 miles south of Provo you could had crossed. I visited Salt Lake City and liked the city compared to L.A. with its many problems. I noticed the regional population (2 million) is smaller than the Inland Empire CA region (4 million) an extension of the L.A. megapolis. Sometimes smaller is better. Sorry I caught your post too late to add. However, it looks like you had a very good trip. Just in case you make it again and for others. Mt. Evans is the highest paved road in North America. It is an awesome view. I did it on a motorcycle in 2009. As someone said Independence Pass is good. If going to Utah and Moab I rode UT 128 from I-70 to Moab a the first of May and it was a great road with plenty of scenery and camping.